An unusual mini Blue tide after the stormy seas earlier this week. Just 3 Bluebottles, but 11 Porpita, 13 tiny Glaucus sp. (blue sea slug), a few Violet snails (Janthina) and the tiniest Velella I have ever seen! Physalia physalis….apparently some colonies have their floats aligned 45*left of the wind and others at 45* to the right so that not all will be stranded together.This one must have been an unlucky one ! Porpita porpita has a disc like float & marginal tentacles for feeding. These creatures living on the surface of the water are called neuston. Most are countershaded blue so when viewed by predators in the air they look deep ocean blue and from underneath they appear silvery. Glaucus atlanticus ….ventral surface up when floating. Another tiny creature - Glaucous atlanticus - washed ashore, sometimes called a sea lizard sea slug, creeps along the sea surface upside down & feeds on Velella & Physalia. Underside of Janthina ..showing its ”Bubble raft” secreted from the foot. 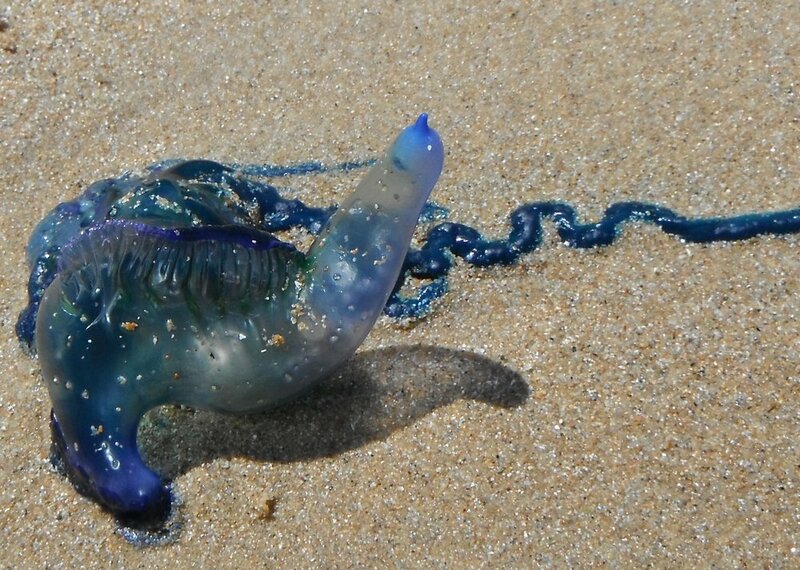 They also feed on the Bluebottles. Velella velella - has a disc shaped float which has feeding tentacles round the margin & a sail on top.